Brief Synopsis – A treasure seeking adventurer teams up with a member of the World Health Organization as they try to find a long lost Confederate ship while being pursued by a vengeful African dictator. My Take on it – After having read a number of the Dirk Pitt adventures, I can easily say that I’m a fan of Clive Cussler most famous adventurer. 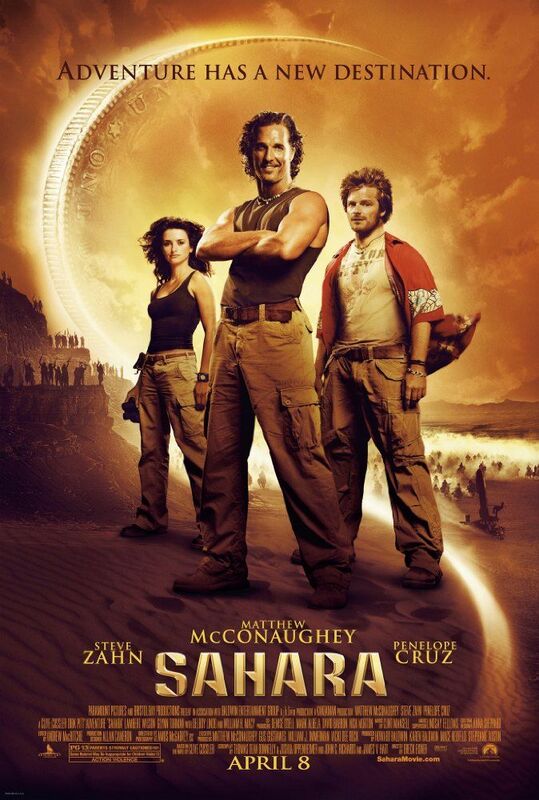 The problem with this film is that they try too hard to turn the character of Dirk Pitt into a new and invigorating Indiana Jones for the 21st Century. The adaptation loses so much of the impact that the story in the book had and I must admit that once again Hollywood has failed at adapting a potentially great story. The casting of Matthew McConaughey and Penelope Cruz must have seemed great on paper, but their characters have such poor chemistry together that it gets to be quite laughable. They seem so mismatched in just about every interaction between them. Steve Zahn is great as Pitt’s sidekick and is the perfect choice for the comic relief in the story. Bottom Line – Poor attempt at turning Dirk Pitt into the new Indiana Jones. His adventures by Cussler are amazing and I especially liked this novel, but the adaptation just isn’t as good as it potentially could have been. McConaughey and Cruz have terrible chemistry together and are extremely mismatched here. Zahn works well as the comic relief, and even his antics never lose their weight the whole way through.